We do our homework to get you the highest payout. Bring in your diamonds, gold jewelry, watches, and silver. Do you own something valuable? Would you sell it if you can get a fair payout? We're a one-stop shop for all your intrinsic valuables! Cash paid within 10 minutes! Sell Diamonds, Watches & Fine Jewelry. Get a Quote for Your Jewelry! 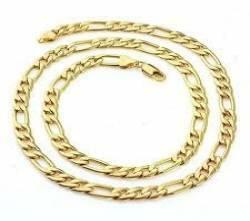 18.6 DWT, 28 grams, 14KT gold chain. We paid $480. "Very sweet people, very fair prices! Had a great experience, can't wait to do business with them again." We are very proud of our “A+” rating from the Better Business Bureau. You own something valuable, and you’d sell it if you can get a fair payout. But do you take it to a refinery? Your friend’s Rolex re-seller? Or the corner jewelry buyers with the “we buy gold” sign in the window. At Global Gold & Silver, we’re a one-stop shop - not just to sell gold in NYC and NJ, but for all your intrinsic valuables. Whether it’s gold coins, your mother’s Cartier love bracelet, a pricey watch, or if your selling a diamond engagement ring, we evaluate it for its highest worth, then make you an offer you can’t refuse. Selling gold in NYC, Selling Gold in Brooklyn and even New Jersey has truly never been easier. We don’t just negotiate transactions. We build relationships. That’s why our dealings are invariably fair, honest, and pleasant. So long as it’s real, we buy every piece— no matter what. Our most fervent wish is that you enjoy the experience, speak highly of us…and come back. This is exactly how we built our reputation over the years that we have been in business. If you refer to some of the highly accredited business directories that the internet has to offer, you're going to see review after review about the great service that we offer our customers every day, and how we are the place to sell gold in NYC and NJ. We take pride in making our customers happy by showing them the experience they deserve, which is why we built our operation in contrary to the way people imagine a Cash for Gold establishment to be. Our locations provide a professional atmosphere, and is staffed with Certified G.I.A Graduate Gemologists. You can rest assured that your gold, silver, diamonds and/or jewelry is going to be evaluated by a true professional in the field, which ensures a fair payout! "Global Gold & Silver was a godsend when I wanted to sell my jewelry"
Read some other things that make us different than the rest [about us]. Sell Gold NYC, Sell Silver NYC, Sell Diamonds NYC, Sell Watches NYC, Sell Estate Jewelry, Sell Gold NJ , Jewelry Buyers, and other valuables.